w/ Rushmøre, Ugly DJ Co.
A soft green turf lined the bricked footpath leading up to Club Kahuna, in the heart of Subiaco on Saturday. An intermittent rain fell against the backs of guests as they boisterously waited in line for the club to let them indoors. It was a strikingly different entrance and energy to other bars further down the road. In contrast, this felt like the fast lane to a promised land. 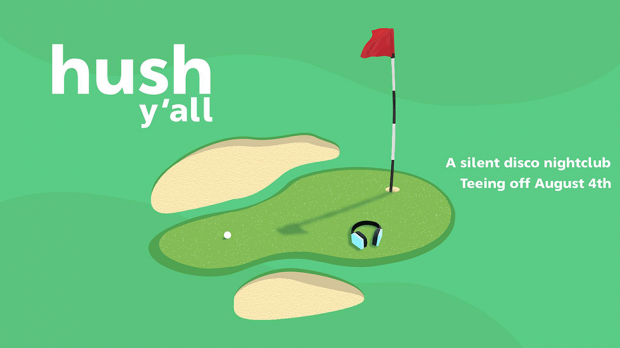 Hush Y’all (Season One) is Perth’s first ever silent disco-dedicated club night and on Saturday, the launch of the fortnightly event tee’d off at 9pm. My rag tag group of rascals and I set off to be there by 9.30pm which was an arrival that graciously got us free entry. Until 10pm it’s free, then you’ll need to cough up a solid $15 to race up the four-level fluorescent-lit staircase and onto the course. Usually, as you climb the stairs to any club you can mark each step by the increase in the volume of music. Nearing the entrance, you usually leave your conversation and thoughts about requiring a healthier lifestyle (to make it up the staircase in the first place) behind you. It was abnormally quiet during the ascent as the tension and excitement grew. As we entered the room, a man sitting on a stool passed us our headwear for the evening and we peeked down the corridor to a sea of green and red lights. There were two music channels to choose from as Rushmøre and Ugly DJ Co. battled for punters listening to their station in order to claim a prize at the end of the evening. One would drop remixes of 90s and early 00s whilst the other played out the classics with some 70s throwbacks. As the night progressed, the music started to blend and it became harder to be loyal to one channel. It was Rihanna to Nirvana to Carly Rae Jepsen to remixes of The Notorious B.I.G. to Smash Mouth. There was even a notable Cotton Eyed Joe play-out at some point. It was nostalgic and easy-to-dance-to music, where you’d be standing in the middle of the dance floor with the dude next to you head banging along as you shake like Beyoncé. The freedom and fun that choosing your own music brings cannot be questioned. Music aside, the atmosphere of the club night was fantastic. As a golf-themed event, the removal of headphones granted you the sound of a golf game playing gently in the background as you could order a drink from the bar without needing to shout. There was a golf movie playing on the wide screen with golf books leaning against couches and a giant cut-out of Tiger Woods that could be seen from the balcony. It was quirky, it was different, and it really, really worked. As some opted for the golf clubs as dancing tools, the golf paraphernalia solidified the varying factors this night out had to your average night out. It created visual stimuli to an experience that was so different to the tried and tested formula for a club night, inviting you to interact and engage with the theme. It was completely left field to what has been done before and a success at that. The drinks were cheap, the music was good, the theme was fun and the crowd was engaging. The only thing I would suggest to organisers is that it needs more costume prizes. Next time I don’t want to be the only one in a collared shirt, checked pants and head band, thank you. For those interested in experiencing it for themselves, you can find information about the next event here.